Home defense is a very major reason for why a lot of people buy guns in the first place. This is truly a wise measure to take, since, in home defense situations, you cannot wait for help to arrive and otherwise will face the intruders with bare hands. Different people have diverse opinions on what kind of and which weapons are good for home defense. Some stick by shotguns, some with carbines, and some with handguns. For this article, we’ll focus on the use of handguns, and especially the Glock range of pistols for home defense. We’ll learn about the advantages of using a Glock for such situations and the Glock models which are apt for the purpose. We have compiled a list of the most appropriate and useful Glock handguns based upon research and user experiences. So let’s begin. Glock pistols don’t need an introduction. They have been widely used by defense personnel, hunters and shooters worldwide for every purpose fit for a handgun. Let’s take a look at certain aspects to take into consideration before buying a Glock for home defense. If you are not into CCW, a full-sized handgun is recommended for home defense. The reason is obviously the grip and resistance to recoil. A bigger gun will offer you a better grip so you don’t fumble. Plus, a larger frame has more surface area to distribute the force of the recoil. However, if you want to use the same gun for concealed carry, you might consider buying a compact-sized model. This is a very important aspect of home defense. The more rounds you can fit into a single magazine, the better it is. Having a gun with at least ten rounds or more is highly recommended, since this may come in handy when you can’t reach extra ammunition, or for fighting multiple hostiles at once while improving your chances of making a hit. You must go for a caliber with the most stopping power. However, you must also be able to handle the recoil. The best choice for most people is the 9mm or the .45ACP since they are easily available and quite inexpensive for practice. Finally, it is better to have a Glock with night sights for home defense. That’s because most intrusion attempts are made in low light conditions. Having a good pair of night sights greatly improves your accuracy. Additionally, mounting a tac light and laser setup is also useful for emergencies, though may be overkill if you only keep it for emergency situations. Reliable and Accurate- Glock pistols are among the most reliable and accurate handguns on the market. They are widely used by defense forces and law enforcement personnel across the globe. The last thing you have to worry about when using a Glock are malfunctions. That being said, Glocks are also extremely accurate handguns, something you can trust your life upon in a critical situation. ​Glocks lack external safety, so you don’t have to mess around finding the safety switch in a life or death encounter. The Glock itself has three internal safety mechanisms which eliminate the need for an external safety switch. We recommend striker fired handguns over hammer fired ones. That’s because the former has an identical trigger pull for every shot. Plus, you don’t have to pull the hammer back, which sure takes a second. If you want to recognize the difference - hammer fired handguns have an exposed hammer on the rear end of the slide. Glocks are extremely simple to operate, just like an AK-47 when discussing rifles. Glocks do not require a lot of cleaning and maintenance like most other handguns. Plus, their magazine feed operation makes them easier to use when compared with revolvers. A very good advantage of using Glocks is their customizability. There are a ton of aftermarket parts and upgrades available for it. So you can upgrade it to your individual specifications for accurate and comfortable shooting. Here are our top picks when it comes to home defense Glocks! The Glock 17 is among the most widely used service pistols in the world. Most police officers in the U.S. prefer to go with the G17. In fact, the U.S military is planning on replacing the Sigs of the SEAL’s and Marines with Glocks. The G17 is the first installment of the very long lineage of Glock pistols. The Glock 17 was introduced back in 1982 and has been a very popular handgun since then. It has set the benchmark for testing the usability and effectiveness of handguns. The polymer-based frame of this handgun makes it extremely light to carry and use. The G17 has undergone upgrades over time and still remains one of the most reliable handguns on the market. It has a capacity of 17 rounds, which is enough for home defense, even if you have a single magazine. The Glock is a striker fired weapon which eliminates the hassle to cocking the hammer, and other issues related to it. Additionally, the three-stage safety of Glock weapons makes them safe to store and use. This Gen 5 Glock has limited parts, with a beveled magwell for faster reloading. It has an ambidextrous slide release and an under-frame accessory rail to allow you to mount lights and lasers. This Glock 17 has factory installed night sights, which allow you to shoot accurately under low light conditions. However, you can still upgrade to tritium-based sights. The best advantage of using Glock pistols is the availability of aftermarket parts and accessories for them. The G17 is a widely used service pistol and has a huge magazine capacity to help you make a stand against home intrusions. It has factory installed night sights and an accessory rail. The 9mm ammo is also easy to handle. The Glock 19x is a more compact version of the full-sized Glock 17, according to the manufacturer. It has a shorter barrel and pistol grip compared to the Glock 17, which also makes it good for concealed carry use, while not compromising on ammo capacity. The Glock 19x comes with a 17+1 round capacity and the package includes two extra 19 round mags as well. Glock is a reliable and rugged duty weapon, trust by militaries and police forces across the globe. The G19 is a widely used handgun for EDC since it packs the power of concealability and ammo capacity into one package. 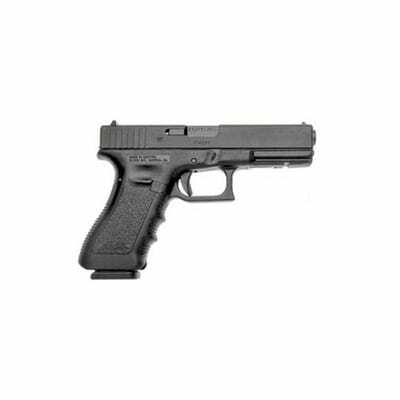 The Glock 19x is easy to service and is extremely well-sized for shooters with small hands, especially for women. The Glock 17 magazines are compatible with Glock 19x, however, the reverse is not possible. 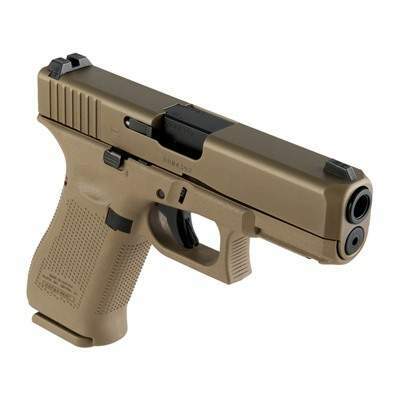 It is important to note here that this is the Glock 19X model, so it won’t accept the normal Glock 19 magazines. The package includes one plastic coyote color case, a couple of extra mags, and a cleaning brush and rod. So overall, it is a complete G19X package for you. The Glock 19x comes pre-installed with rear night sights, so you don’t have to buy them separately. Additionally, it has an under-frame accessory rail to mount lights and lasers. 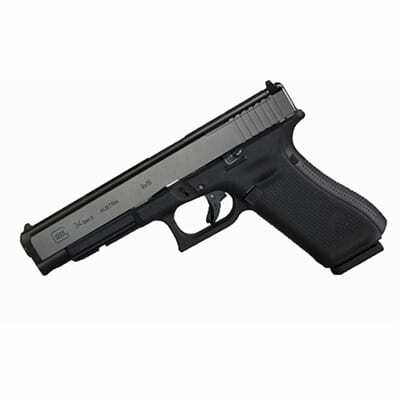 The Glock 19x is a compact and more concealable version of the Glock 17. It has a high ammo capacity and can also be used for CCW and EDC. Exclusively suitable for people with small hands. The G34 is a Glock pistol with an extended barrel, large slide, and longer sight radius. The G34 was designed as a competition pistol, which it is. A lot of people use the G34 for competitions like USPSA, IDPA, IPSC, and GSSF. The longer slide results in a larger sight radius(distance between front and rear sight), which makes the gun exceptionally accurate, no doubt, leading to its wide use for competitions. The G34 has an ammo capacity of 17+1 rounds which can be extended to 33 rounds if you desire. The Glock 34 is a full-sized pistol, with ergonomics very similar to the Glock 17. The larger frame of the G34, however, makes it very difficult to conceal. The G34 is a couple hundred dollars more when compared with a G17, so if your only intention is home defense, you might want to go for the former. However, if you are into shooting in competitions and more accurate handguns, the G34 is your answer. The Glock 34 is a large-sized pistol, but it's very accurate as well. The pistol is widely used for competitions so if you are a regular shooter, you can kill two birds with one stone. The Glock 22 is by far the most popular service pistol in the U.S.A. 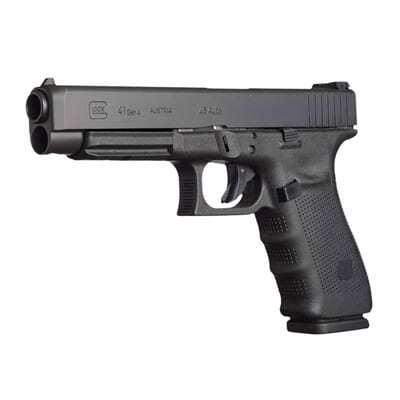 The G22 is a full-sized Glock pistol which fires the powerful .40 S&W round. It has more power compared to the 9mm ammo. That’s probably why most law enforcement agencies prefer it to other handguns. The G22 is a striker fired, magazine fed handgun with a basic capacity of 10+1 rounds, which can be further extended. 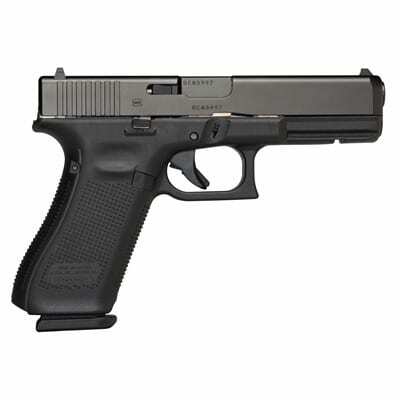 The G22 holds more rounds than any other handgun in a similar size, weight, and caliber class. This gives you even more power and advantage in home defense situations. Since it is widely used by law enforcement personnel, there’s no point in arguing about its effectiveness and stopping power. That’s because a police officer is more likely to face a hostile than a normal person. Due to its full-sized frame, the G22 is easy to grip and handle. The gun sure can’t be used for CCW, but that’s not the main point we are focused on in this article. The Glock 22 is a widely used duty pistol due to its simple and reliable operation, and the power of its .40 S&W caliber. The Glock 41 is a full-sized pistol with an extended slide, longer barrel, and a larger sight radius, making it exceptionally accurate. It can be compared with a Glock 34, however, the difference is in the caliber. The G41 shoots .45 ACP rounds, the same ones used in a 1911. These rounds are more powerful compared to the 9mm and .40 S&W. As a matter of fact, these bullets have a 127 percent larger diameter than the 9mm. However, this also increases the amount of felt recoil with these bullets. The G41 has a 13+1 round capacity, which is quite good for such a large caliber handgun. The G41 is good for home defense, but only if you have properly practiced shooting it. The round has more stopping power, so you’d require fewer bullets for taking down more targets if your shooting and handling skills are good. The G41 has an under-frame mounting rail to let you add tac lights and lasers for better accuracy. The G41 should be your choice if you like working with large calibers. The gun has a large capacity respective of the large caliber and offers the customizability and simplicity associated with Glock pistols. Glocks are widely used across the globe by law enforcement agencies and militaries. The line of Glock pistols has a plethora of variants featuring different sizes, calibers, and capacities. The best part of using a Glock is its simplicity, safety features, and the availability of aftermarket parts for making upgrades. A good home defense pistol must be easy to handle, have a good ammo capacity, and should be accurate under all conditions. There might be certain doubts related to using Glocks as your primary weapon for home defense. To break the ice, we have compiled a short FAQ section to give you a brief overview of the general questions associated with the topic. Is the 9mm Good for Self Defense? The 9mm is the most popular and widely used handgun caliber in the USA. The 9mm bullets have a good stopping power, complemented with accuracy. They have the apt recoil to be handled by both a strong person and a weak one. The 9mm is very controllable in compact and sub-compact guns, which makes it exceptional for concealed carry handguns.You can choose the FMJ or hollow point cartridges based upon your requirements. Additionally, it is quite inexpensive (approx. 20 cents a round) to practice with. What is the Best Caliber Handgun for Self Defense? The best caliber handgun for you is the one you can handle the best. However, if we talk about data, the 9mm has clearly an edge over .45 and .40. That’s because the latter calibers pack a helluva punch which might go out of control. The 9mm has a controllable recoil. Plus, you can pack more rounds of 9mm in a magazine, compared to less .40 and even fewer .45 rounds. Additionally, the 9mm is easily available and comes in a wide variety of loads. So clearly, the 9mm Luger caliber handguns are best for self-defense. 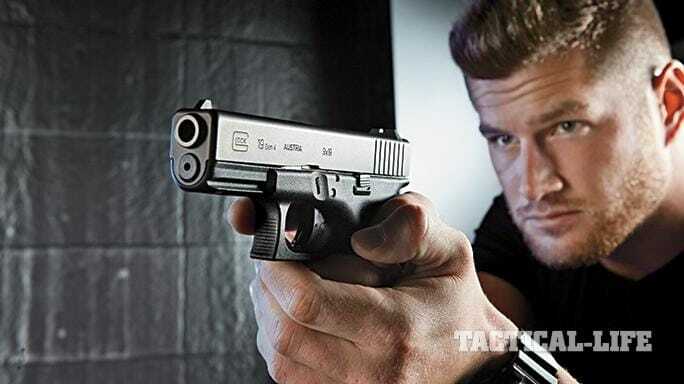 How to Store a Glock For Home Defense? The best place to store a Glock for home defense is a quick access gun safe, mounted or placed at a location you consider strategically or tactically suitable. It can be on your nightstand, under the desk in your room, office, or any other place where you can access the weapon in a critical situation. Home defense weapons should be stored in such a manner that they can be accessed easily, quickly, and quietly when needed.